Today Simon headed off with Grandpa on his big hiking adventure. Elizabeth, Grandma and myself headed off to have high tea. Lizzy really had a great time. 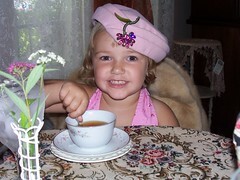 She chose her own hat and drank strawberry shortcake tea along with some yummy tea savories and sweets.